Our MicroGrid® and PolyGrid® expanded materials reduce the cost and improve the performance of electrolyzers, PEM, and SOFC fuel cells. How Dexmet Expanded Materials Improve the Efficiency of Electolyzers and Fuel Cells. Dexmet has provided materials for power applications for over 50 years. Dexmet has redefined how expanded materials can be incorporated into electrolyzers, proton exchange membrane (PEM), solid oxide (SOFC), and other fuel cell applications. When working with expensive materials like niobium, zirconium, silver, titanium and nickel, expanded products provide efficiency advantages that make it a more economical solution over similar perforated or chemically-etched products. 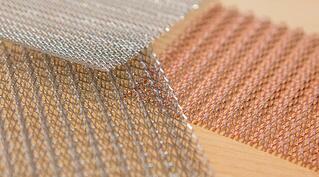 The unique simultaneous slit and stretch process yields up to 90% more finish product output than raw material input. When trying to reduce the overall cost of a fuel cell stack, expanded materials are an ideal solution. The 3D geometry allows for more consistent diffusion over the catalyst increasing efficiency. Dexmet has configured a product that answers the need of Fuel Cell designers trying to increase the efficiency of the anode and reduce stack cost through multi-functional products. 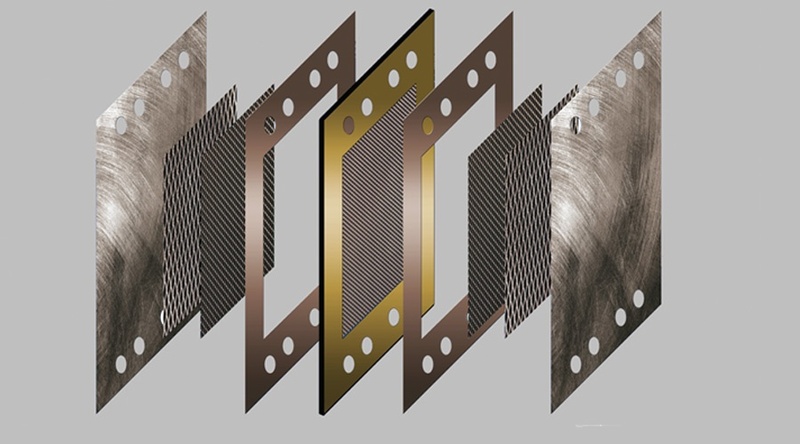 Dexmet's new expanded corrugated product, when used as the anode substrate, increases the amount of surface area allowing for catalyst material to be applied. The new product can also enhance the flow through the substrate for better ion separation. 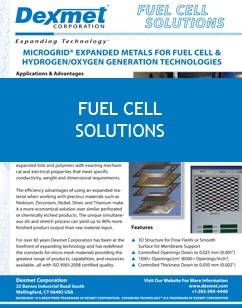 To learn more about the applications and the benefits of Dexmet’s expanded MicroGrid® materials for electrolyzers and fuel cells, download our product data sheet. Let our experts demonstrate how you can incorporate innovative expanded materials into your fuel cell designs and improve their efficiency. Let us help you improve your electrolyzer and fuel cell designs with expanded materials. Contact one of our experts and start the conversation!